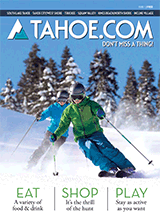 You can ski or ride right out your back door at Granlibakken Tahoe. Our intimate ski hill is perfect for beginner through intermediate skiers and snowboarders, with rental shop, ski school and warming hut on the premises. Rental shop and warming hut are open daily, all season. The ski hill and ski school are open Friday-Monday throughout the season; and daily during the winter season and during holiday periods. Check our event calendar for opening days. All full-day lift tickets include a sledding pass.